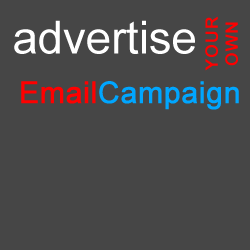 Email campaign – Full page with no other competing adverts, etc. Maximum 500 words – Text is mandatory – we do not accept just photographs or PDF files for a news campaign. Provide text in .doc or docx or odt file format or typed directly into an email. Maximum of 3 Photos of your product/services. (File format: .png or .jpg or .gif files – Minimum 960px wide. Maximum file size: 256kb each). PLEASE NOTE THAT IN ORDER TO AVOID SPAMMING OUR MEMBERS, WE STRICTLY LIMIT EMAIL CAMPAIGNS TO 1 PER WEEK, SENT ON MONDAY, TUESDAY OR FRIDAY ONLY. If your promotion is time-critical for a sale or special event, please get your booking to us at least 3 WEEKS in advance. Text wording is mandatory in the news campaign – we do not accept just photographs or PDF files for an email campaign. Many of our Members set their browsers to NOT download images inside emails so your pretty promotion photo will never be seen – just an empty box on the email page = waste of your money! Provide text in .doc or .docx or .odt file format or typed directly into an email. We do not accept PDF documents or Powerpoint files for the email campaign. We do not send emails with any attached files. You can put a link to a file that is to be downloaded from your own website page. You must provide a subject or title for the email campaign i.e. the main heading. Don’t hard-sell, try to provide some value-added information as well as just trying to punt your product or service. Our designers will do a basic page layout with the information that you provide, free of charge. Attach your document with text or type the campaign text into the email. Attach up to 2 photos to the email. Our design team will code and lay out the Email campaign page using the information, logo and photos. We will publish your Email campaign as soon as there is an available week (to avoid spamming members) – Book Early! We will notify you when the Email campaign will be sent and send you a draft for your approval. Please carefully check the Email campaign and immediately report any problems or errors. If we do not hear from you within 2 working days after publishing, we will presume that you have accepted the Email campaign as being correct in all respects.